Where the scenery is always inspiring and year-round outdoor activities are limited only by your imagination. The Village of Sun Peaks is 45 minutes from Kamloops. Sun Peaks is a world class all season BC ski resort. Sun Peaks is British Columbia’s second largest ski area with three mountains surrounding an intimate ski-in, ski-out village. While skiing and snowboarding are at the heart of Sun Peaks, cross country skiing, mountain biking, orienteering, hiking and 18 holes of championship golf are well known Sun Peaks Resort summer activities, in addition to numerous festivals and events. Sun Peaks is easily accessed via Kamloops airport (45 minutes) and then via Sun Peaks Resort Shuttle and Kelowna Airport (2 1/2 hours) or by car with a 4 ¼ hour drive on the Coquihalla Hwy from Vancouver. Connect through Vancouver, Calgary, or Edmonton Airports with Westjet or Air Canada. At a place where, no matter what position you chose, inspiring mountain views are part of your day. Are you an outgoing person who holds a door open for someone or helps a stranger? If so, the Hearthstone Lodge is looking for you! 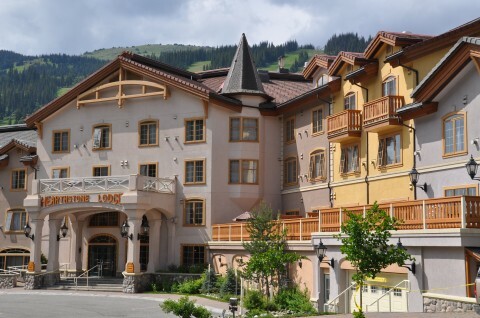 The Hearthstone Lodge, located in the centre of the Sun Peaks Resort village, offers the convenience of a Sun Peaks vacation home for its guests. The Hearthstone Lodge’s 70 spacious suites each feature fireplace and kitchen – perfect for those with families or who prefer being self sufficient. The Hearthstone Lodge at Sun Peaks is well known for its outdoor hot tubs, convenient ski / golf storage, fitness facility and we can’t forget to mention that mouth-watering Mountain High Pizza and Bella Italia Ristorante are our neighbours. Come where employers understand the value of play and adventure and encourage you to climb the peaks, ride the trails and ski the slopes. Is at the heart of Sun Peaks Resort. With forests and valleys, peaks and lakes, Sun Peaks Resort and neighbouring mountains are one amazing place and waiting for you to create your own stories. People from all over the world live, work and play here. With a team of energetic, service-minded individuals from across Canada and around the globe, the Hearthstone Lodge will be your base for a stimulating social environment.